It's time for Sunday Supper! It's Sunday and it's the only day of the week I'm committed to making dinner in my house and this week the theme is "On The Hunt". This week's hosts are Stacy of Food Lust People Love and Tara of Noshing With the Nolands. The Sunday Supper Crew are sharing recipes with ingredients that are hunted or foraged. This is the 21st century, so ingredients may or may not be extremely exotic but could include wild game like venison, boar or rabbit and vegetarian options like mushrooms, truffles, wild berries or wildflowers and greens. Being "on the hunt" can also mean a search for a special ingredient that you have to source online or hunt down at a specialty market. I'm always in the mood for specialty items that can't be found just anywhere. It makes me happy to look for an item so special and rare, only a select few can have. This week's special ingredient: Hot Italian Sausage from SausageWorks at Lowes Foods. 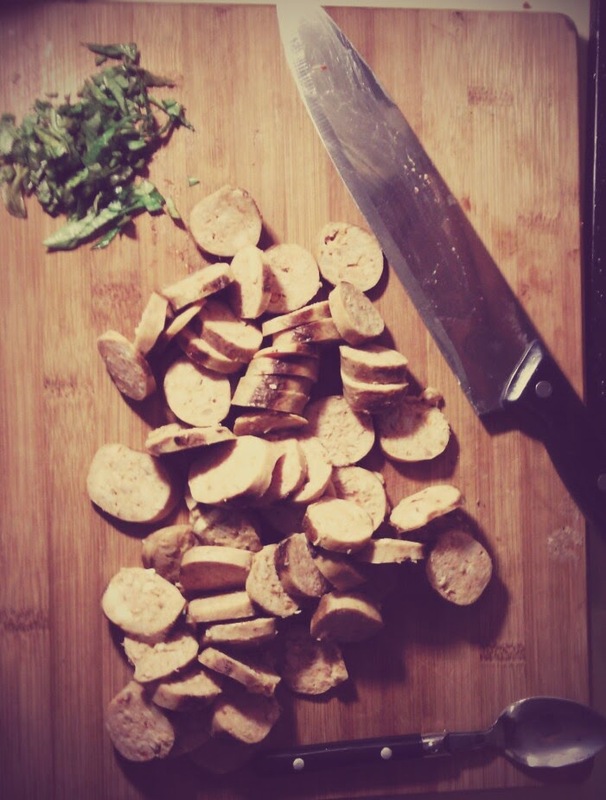 Sausage itself isn't really exotic, but do you cure, smoke, stuff or age your own? Every time? Probably not. This special sausage is called Fiery Italian and it doesn't taste like the classic Italian sausage. 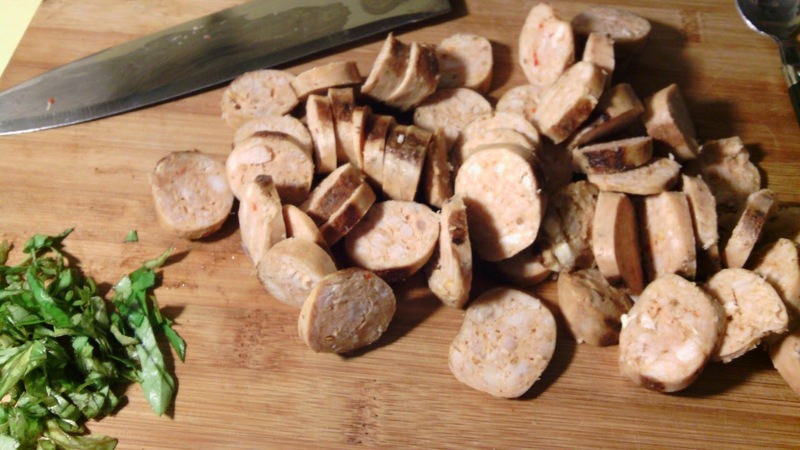 Described as "a hot and charming blend of pepper, spices and house-made hot Italian pork sausage", it has a perfect balance of spice interlaced with great chunks of fat throughout. SausageWorks is a new concept at all of the newly remodeled Lowes Foods grocery stores in the Southeastern U.S. Over two dozen different varieties of sausage have been made in-store over the past few months. Using local ingredients like sweet potatoes, beer, turkey, apples and even sweet tea and grape soda have made these sausages one-of-a-kind. One of the best parts about the new Lowes Foods is that they let you sample EVERYTHING. There are people walking around with samples and they encourage you to eat and eat and eat and stay for a while. There's free wi-fi, one location even has a coffee bar. One trip and you won't want to leave. After sampling many, many pieces of about 8 different sausages, I chose the Fiery Italian, because it had the best flavor. I use traditional hot Italian sausage in my lasagna and sometimes there's nothing like a hot Italian that's been blistered over hot coals or a hot skillet and decorated with a little bit of American mustard on a French baguette. What an international trifecta! 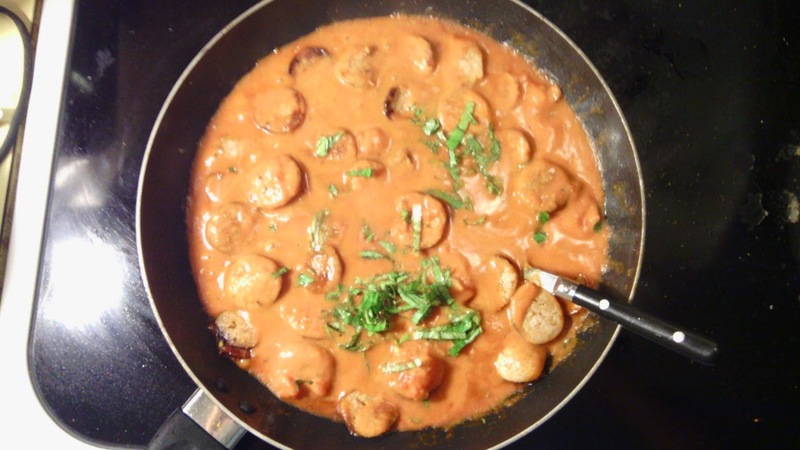 This time I'm using it to create this Spicy Sausage Pasta Skillet. A beautiful pink tomato vodka sauce accented with the caramelized Fiery Italian Sausage rounds, sprinkled with fresh basil (that I grew myself!) simmers away while you boil and cook your pasta. I use mini pasta shells or conchigliette for this dish because the sauce settles into the little cup of the shell and it soaks into the grooves of this popular conical noodle. My favorite part: the pink tomato vodka sauce. 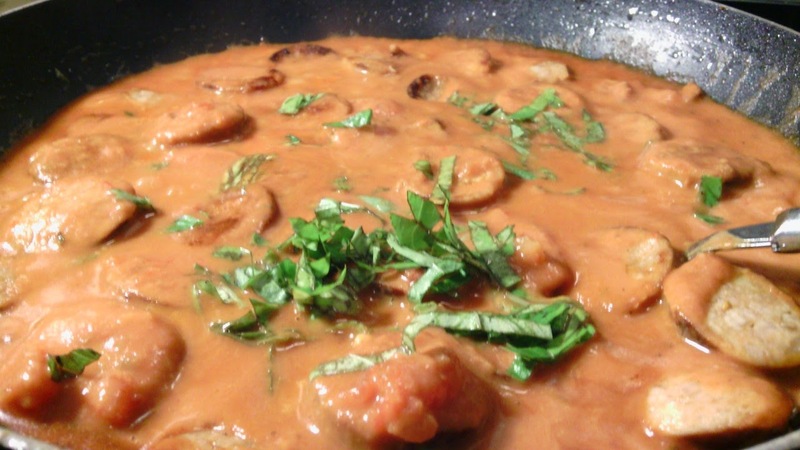 Traditional vodka sauce just uses enough vodka and just enough cream to flavor the tomatoes and change the color of the sauce. I take it a step further add just a little bit more vodka, add red pepper flakes and cool it all down with a huge dollop of whole milk ricotta. I don't play when it comes to dairy. Go big or go home. Heat a large skillet over medium-high heat. Add the sausage and cook, stirring, until browned, all pink has disappeared, and the edges of each sausage slice are caramelized. Meanwhile, cook the pasta in a large pot of boiling salted water until al dente. Melt the butter in a large saucepot over medium heat. Add the red onion and cook, stirring occasionally, until slightly softened, about 3 minutes. Add the garlic, red pepper flakes and cook, stirring, 30 seconds. Remove from the heat and stir in the vodka, tomatoes and salt to taste. Return the pot to medium heat and simmer, stirring frequently, for about 8 minutes. Stir in the heavy cream and cook until the sauce thickens slightly, about 3 minutes. Stir in the basil. Drain the pasta and transfer it to the pan with the sauce, and toss to coat. Season with salt and pepper, to taste. Top with a large dollop of ricotta cheese or small dollops around the pan and garnish with sprigs fresh of basil. Cover the skillet for 3 minutes, just so the ricotta softens. Garnish with grated Parmesan and serve immediately. Don't forget to forage safely from the comfort of your phone, tablet or computer and check out all of the other fantastic Sunday Supper recipes! Sugar Plum Fairy Jam from What Smells So Good? That sausage sounds absolutely wonderful! 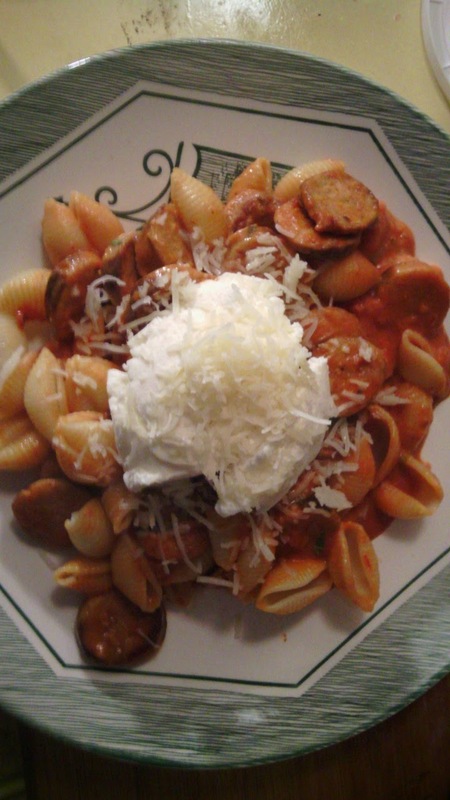 I love spicy Italian sausage, especially in a pasta sauce. Beautiful! Good luck with the competition! Dang it. Now I'm going to have to hunt down and see if Lowes stores are here in Atlanta. The sausage sounds incredible and so does the pasta you made with it too. That looks so good and comforting, great recipe!! I literally just went mmmmm.... my family would love this deliciousness! This sounds fabulous! Perfect for a freezing cold evening curled up in front of the fire... I'm so craving good sausage now! I'm glad you lost your jitters and can/could compete! In the locally made sausage here they come up with all kinds of great flavors too! Mmmm, this is definitely my kind of dish - comforting and delicious! I love the new look of your site, Nik. I hope you had a great time at the World Food Championships! It looks like such a great event. And this pasta skillet is something that I'd love to serve my family for dinner. My hubby would LOVE this! Love sausage in practically any recipe! I loves me some sausage in pasta! I also appreciate a girl who doesn't skimp on the cheese. I hope you are competing well! I heard the event was wonderful and hello I love a good spicy sausage! Oh yes! I need some of this now! And I love that generous dollop of ricotta! The World Food Championships would scare me to death. You do competitions so well though! Always rotting for you. Love skillet meals too! I hope you had a great time at the competition! And this looks so comforting. Hope the competition went well! That pasta looks amazing. YUM! I loved the theme this week! And your dish is perfect for it, so yummy! Oh YUM! So glad you added cream into the sauce to make it even more delicious. I'd go back for seconds on this dish for sure! Good luck in the competition! Have fun! Love this comfort dish. I've so enjoyed all of your competition photos. Looks like you are having a blast! What a delicious looking pasta dish...yum! Sitting her envious of not only this dish but of Lowes Foods! This sounds lush, love tomato, and looks easy to make, Thanks for sharing.